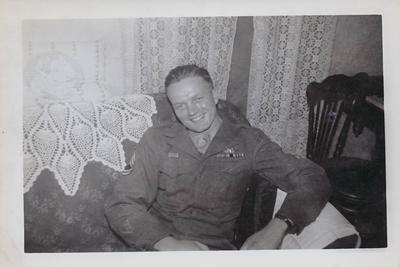 My father, Alfred W. Young, Jr., flew his 19th combat sortie as the radio operator/gunner with the Lt. Marv Ehrenberg crew. He made a record of the mission in his journal – just another 8 hour and 20 minute day at the office. The weather finally cooperated on the last day of March 1945. The target was the Linz, Austria, Marshalling Yard which had 159 guns ready and waiting for us. We were one of eight ships in the #1 box leading the rest of the 376th. The lead ship in our box piloted by Captain Edward Reno had Lieutenant Colonel Taylor the 514th Squadron Commander flying aboard. After taking off, forming up, and crossing into Italy off the Adriatic, we followed the relatively clear, sparsely cloudy Italian Udine Valley north towards Austria. Over the Udine we led the boxes into some very jumpy prop wash from the other wings ahead of us. We fought our way through a front up and over the Alps and settled down a little on the last leg to Linz. During the bomb run, the flak made a thunderous impact only a few feet below us. We could feel the shock wave of each burst as our auto pilot fought the turbulence as we clawed our way to the target. Suddenly, and in rapid succession, we received about fifteen or more whoomphs right under our ship. But the damage report revealed we received only three holes. I dreaded much more than those three hits because the flak sounded much closer. One of the hits was in the nose by the navigator’s position. Some more German steel hit the left wing, directly up into the number two tank, but the brace stopped it. The third hit was a pin size hole in the horizontal stabilizer. We didn’t know about that hit until we landed back at San Pan. Most of the other ships in our box weren’t as lucky. Ship #60, Double Shot Sam, piloted by Lt. Glenn E. Rendahl, in the seven position, was hit in the bomb bay fuel lines or the number two tank, but kept up with the formation to the target. Ship #72, What Next?, piloted by Lt. George T. Lumsden, in the number five position, had one engine knocked out and two other superchargers gone which caused the ship to drop immediately below the formation and off to the right after dropping her bombs and leaving the target. Ship #75, piloted by Lt. Roy H. Hatem, had her hydraulic line shot out as well as her #3 and #4 engines. Double Shot Sam fell behind the formation following bombs away after we left the target going south. I sent them a message with the heading to the Russian lines and wished them the best. What Next? decided to join Double Shot Sam in trying to make it to the Russian lines less than a hundred miles away to the east. Ship #765, our CO’s ship, had to feather her #2 engine and ship #70 with Lt. Jack E. Burlage in the left seat had to feather two engines. As we came over Zara, Yugoslavia, Ship #70’s situation turned desperate. Her #2 engine wind milled to 3300 RPM and her #3 engine was running away. But using outstanding piloting, Lt. Burlage successfully made an emergency landing at Zara despite having one of his stabilizer controls shot away. Sadly, #70’s bombardier had been hit and killed. Ships #765 and #63 headed to the Italian coast while #77 took a course of her own to get back to base. We led Lt. Hatem and his crew in Ship #75 back to our airfield where they circled the base to crank their gear and pump their flaps down before landing. They were the last to land, but they landed safely with no brakes and with over 30 major flak holes. The two ships which headed to the Russian lines were MIA. Ship #70, the ship which made the emergency landing in Zara was so extensively damaged it had to be left there. The crew was flown out by C-47 to Bari and then back to San Pan. The dead bombardier was flown back to Italy on another plane. Zara, an Italian enclave in Yugoslavia, was considered part of Italy and saved many ships and crews after it was abandoned by the Germans in late 1944 and taken over by the Partisans, friends of the Allies, for the remainder of the war. I prayed the two ships which were trying to make it to the Russian lines had made it and either found an airfield to land or safely bailed out. Both ships had thrown out everything not nailed down to lighten the load to better their chances of reaching the Russians. After the mission, our pilot, Marv Ehrenberg, thanked each one of us in getting bombs on target and us and the ship back in one piece, but our squadron ended up having two more ships and crews MIA. I was definitely happy to make it back in one piece after seeing our squadron shot full of holes. If we hadn’t been flying in the #6 position in the formation we could have been the ones fighting to get to the Russian lines and meeting a fate none of us wanted to experience. War truly is a game of inches, position, and luck. It amazed me our ship had so little damage. I walked over to survey the damage under the left wing. If the flak hit had been a little more to the left or to the right our whole wing might have blown off if the fuel tank had been punctured. By the grace of God we made it through another one! As soon as we turned in our equipment and finished talking with the intelligence guys, I signed for $149.85 in pay, had supper, and then hurried over to my Italian class, but the day caught up with me. I fell asleep in class along with some other worn out crew dogs. I had Italian language classes every Saturday night from 2000 to 2200 hours and if I had a mission that day it was always tough staying awake in class. After the instructor woke me, I stood for the remainder of the class which ended none too soon – I found myself practically sleepwalking back to Tent #86 and hit my cot just in time before I passed out from total exhaustion. As an end note, both of the crews in my squadron struck by flak on the March 31st mission over Linz, Austria, and who made a heading to the Russian lines, made it. Lieutenant Lumsdan crash landed his ship, #72, What Next?, on a Russian airstrip in Papa, Hungary, and all crew members, in ditch positions, survived the landing. Most of the crew returned to Italy in early May 1945, and all crew members eventually made it back to the states. Lieutenant Randahl, the pilot of Ship #60, Double Shot Sam, after being hit, was reported to be trying to feather an engine and had another one wind milling, crash landed his ship near Pecs, Hungary, about a hundred miles southeast of Papa. He and his crew, likewise, made it to the Russians and safely returned to the states. The father of Alfred William Young, Jr. was Alfred William Young, Sr., an electrician from Cambridge, Massachusetts (born in Somerville, MA in 1896). Alfred Sr. was also a veteran of the Mexican Border Campaign of 1916 and a Yankee Division veteran during WWI. Alfred Sr.'s father was James Shand Young who was born in Fochabers, Lossiemouth, Morayshire, Scotland in 1865. My Alfred Sr. was not your Alfred W. Young. Sorry. Was Alfred W. Young, Jr. the son of World War II War Shipping Administrator of Tugs and Barges in San Francisco, Alfred W. Young? I have been trying to learn more about the older Mr. Young.